Movie Review: I’ve been following Nanni Moretti’s versatile filmmaking career throughout all these years, and he has gained my appreciation by giving a very particular vision about himself and the world that surrounds him. His work ranges from satirical autobiographical essays (“Dear Diary”, “April”), to incisive dramas (the Palm D’Or “The Son’s Room”), to entertaining comedies (“We Have a Pope”) and even political provocations (”The Caiman”). This time around, Moretti’s approach is slightly different, introducing a few new elements to a drama that tries to mirror the real life of a filmmaker who is experiencing great distress. The restless Margherita (Margherita Buy) struggles to shoot her new film about the laborers of an Italian factory demanding their rights, according to her own concept. Inflexible and difficult to get along with, she has trouble to clearly convey her confusing ideas to the actors – ‘you should play the character but also stand next to the character’, she says. The film becomes even more complicated to finish with the arrival of the American actor, Barry Huggins (John Turturro), a sort of ardent, eccentric dreamer who freaks out whenever he gets blocked in his acting. He’s by far the most interesting character of the film. Even sharing some sympathy for each other, director and actor, enter in a, sometimes freeing, course of collision. Besides work, there’s also Margherita’s personal life, which has been turned into hell since her mother was diagnosed with a terminal illness and now lives permanently at the hospital against her will. Margherita and her dedicated brother, Giovanni (Moretti), who doesn’t bring much to the story, were the ones making the decision. Also her daughter, Livia, and a former lover and actor, Vittorio, contribute to the stress, occasionally expressed through unclear dreams and futile flashbacks. 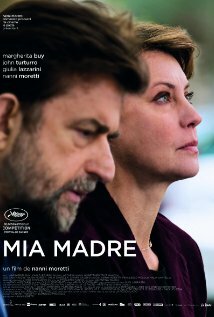 “Mia Madre” advances unevenly, at a vapid pace, and only intermittently was able to enforce some emotional weight. Mr. Moretti has seen better days before, but just as his character’s mom, we’re already thinking in tomorrow because this one is middling.